Oxidative stress, specifically lipid peroxidation, is believed to contribute to the pathophysiology of asthma. This review highlights the pathways through which reactive oxygen species (ROS) may lead to lipid peroxidation. The potential of both the innate and acquired immune systems to activate inflammatory cells and release ROS that may overwhelm the host antioxidant defences and cause lipid peroxidation, accompanied by detrimental pathophysiological effects, are discussed. Despite the evidence demonstrating the importance of lipid peroxidation, systematic characterisation of oxidative stress and antioxidant defences has not been undertaken, largely due to the lack of appropriate biomarkers. This review discusses the emergence of isoprostanes (specifically 8‐iso­prostaglandin F2α) as reliable, in vivo markers of lipid peroxidation, which provides an appropriate tool for studying oxidative stress. Furthermore, the development of techniques to study induced sputum and breath condensate, derived directly from the airway surface, enables the site of oxidative damage to be closely assessed. Evidence suggests that dietary changes that have occurred over recent years have increased susceptibility to lipid peroxidation, due to reduced antioxidant defences. To date, the limited number of long­term (>1 week) supplementation trials have been promising. However, the development of techniques to study isoprostanes in airway­lining fluid pave the way for further studies investigating the potential for antioxidant supplements to be used as routine therapy in asthma. Asthma is a chronic inflammatory disorder of the airways, involving variable airflow obstruction and increased airway responsiveness to a variety of stimuli 1. The airway mucosal inflammatory response in asthma is characterised by increased vascular permeability with oedema of airway walls, mucus hypersecretion with small airway plugging and infiltration by inflammatory cells, typically eosinophils. Asthma prevalence has increased dramatically in recent years 2. Epidemiological evidence suggests that changes in diet, in particular reduced antioxidant intake, have contributed to increases in asthma prevalence and severity and raises the possibility that dietary interventions may improve asthma 3. While oxidant damage is an established consequence of inflammation, the role of antioxidants and reactive oxygen species (ROS) in asthmatic airway inflammation is ill­defined and needs further exploration. Progress in this area has been limited by the lack of sensitive and specific biomarkers of oxidative stress. Isoprostanes are a group of recently discovered lipid peroxidation products that may contribute to many of the pathophysiological changes seen in asthma. This paper reviews recent data on the effects of isoprostanes in asthma and their place as biomarkers of oxidative stress. Oxidative stress describes the damage that occurs when ROS overwhelm the antioxidant defences of the host. Oxidative stress may play an important role in the pathophysiology of asthma 1, 4 and may be a final common pathway leading to tissue damage. Figure 1⇓ is a simplified description of how exposure to a variety of different substances such as allergens, gaseous pollutants, chemicals, drugs, bacteria and viruses 5 leads to the recruitment and activation of inflammatory cells in asthmatic airways, including mast cells, eosinophils, neutrophils, lymphocytes, macrophages and platelets. As indicated in figure 1⇓, allergen­specific reactions involving the acquired immune system are characterised by the production of interleukin (IL)‐5 and the subsequent recruitment and activation of eosinophils. In contrast, stimuli that act via the innate immune system lead to the production of IL‐8 and the subsequent recruitment and activation of neutrophils. However, both of these pathways lead to the production of ROS, primarily due to the respiratory burst of activated inflammatory cells. Mechanisms leading to lipid peroxidation in asthma. 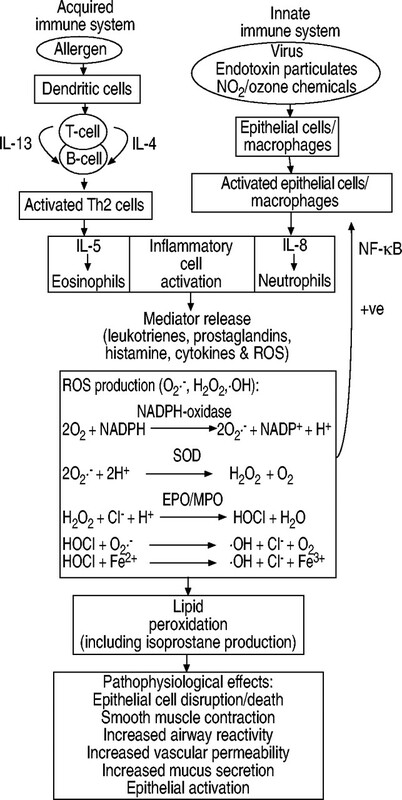 IL: interleukin; Th2: T‐helper type‐2 cells; NO2: nitrogen dioxide; ROS: reactive oxygen species; O2·−: superoxide; H2O2: hydrogen peroxide; ·OH: hydroxyl radical; NADPH: reduced nicotinamide­adenine dinucleotide phosphate; NADP: nicotinamide­adenine dinucleotide phosphate; SOD: superoxide dismutase; EPO: eosinophil peroxidase; MPO: myeloperoxidase; NF: nuclear transcription factor. Activated inflammatory cells respond with a “respiratory burst”, which involves the uptake of oxygen and subsequent release of ROS into surrounding cells. During the respiratory burst, a reduced nicotinamide­adenine dinucleotide phosphate­dependent superoxide­generating system is activated and releases superoxide (O2·−) into the cell. A dismutation reaction, catalysed by superoxide dismutase (SOD) then results in the production of hydrogen peroxide (H2O2), which, in the presence of halide ions (i.e. I−, Cl−, Br−), will react to form a hypohalous acid (e.g. HOCl/HOBr). In eosinophils, this reaction is catalysed by eosinophil peroxidase (EPO). In neutrophils, this reaction is catalysed by myeloperoxidase. HOCl/HOBr may then react with O2·− or Fe2+ to produce another strong oxidant, probably the hydroxyl radical (·OH). Thus, during this “respiratory burst”, the inflammatory cells have released high concentrations of O2·−, ·OH, HOCl/HOBr and H2O2 that may leak into surrounding cells resulting in increased quantities of free radicals in airway tissues. Furthermore, the inflammatory cells of asthmatics have an increased capability to generate free radicals compared to controls, which further contributes to high concentrations of ROS 6–8. Excess reactive nitrogen species (RNS) may also be produced by asthmatics. Cytokines may stimulate increased production of nitrosyl (NO·) 9 which reacts with O2·− to form peroxynitrite, a cytotoxic species that has many damaging effects, including lipid oxidation 10. NO· can also be converted to nitrite, which can oxidise proteins. This may be through nitration of tyrosine, in a reaction catalysed by EPO 11. Elevated nitrotyrosine levels have been observed in asthmatics 12. Thus, the excess quantities of ROS and RNS that are produced by asthmatics may overcome the host antioxidant defences and cause oxidative stress. Oxidative stress can have many detrimental effects on airway function, including airway smooth muscle contraction 13, induction of airway hyperresponsiveness 14, 15, mucus hypersecretion 16, 17, epithelial shedding 18 and vascular exudation 19, 20. Furthermore, ROS can induce cytokine and chemokine production through induction of the oxidative stress­sensitive transcription of nuclear factor­κB in bronchial epithelial cells 21. Peroxidation of membrane lipids leads to the production of isoprostanes, a recently discovered series of bioactive prostaglandin (PG)F2­like compounds. Isoprostanes are produced independently of the cyclooxygenase enzymes via the peroxidation of arachidonic acid, catalysed by free radicals. This pathway has the potential to form 64 isomeric structures, of which 8‐iso­PGF2α is the most well characterised. Isoprostanes have significant biological activity (table 1⇓). Evidence suggests that 8‐iso­PGF2α may act in part through the vascular thromboxane A2/PGH2 (TP) receptor 31. However, it has been suggested that 8‐iso­PGF2α may also act through a novel receptor, closely related to but distinct from the TP receptor, with a high specificity for 8‐iso­PGF2α 32. 8‐iso­PGF2α has been found to be a potent constrictor of smooth muscle. This effect has been observed in vitro in human and guinea pig airways 22 as well as in cultured rat aortic smooth muscle 23. 8‐iso­PGF2α has also been shown to elicit airway hyperresponsiveness in isolated perfused mouse lungs 24, and cause airway obstruction and airway plasma exudation in guinea pigs in vivo 25. Another isoprostane isomer, 8‐iso­PGE2, has been shown to produce physiological responses similar to 8‐iso­PGF2α, but at reduced potency 33. These experiments invite speculation about the contribution of isoprostanes to the airway narrowing that is characteristic of asthma. While the situation in humans in vivo may be different, the full impact of elevated isoprostane levels on pulmonary function remains to be established, and in addition to being a reliable marker of lipid peroxidation, isoprostanes may prove to have an important biological role in the pathophysiology of asthma. Direct measurement of oxidants is difficult since they are highly reactive, short­lived species. Thus, oxidative stress is often measured by observing the damage inflicted by oxygen radicals upon various biomolecules, such as lipids, proteins or deoxyribonucleic acid. Aspects of the antioxidant defence system are also often examined as an indirect marker of oxidative stress. Lipid peroxidation is of particular significance in asthma (fig. 1⇑). Table 2⇓ summarises some of the studies that have investigated lipid peroxidation and antioxidant defences in asthma. Recently published data from the authors' laboratory 28 demonstrated elevated lipid peroxidation in asthma, as measured by 8‐iso­PGF2α (fig. 2⇓). There is overlap between the healthy and asthmatic groups, due to the least severe asthmatics (infrequent episodic) demonstrating median 8‐iso­PGF2α concentrations similar to normal values, while the persistent asthmatics demonstrated median 8‐iso­PGF2α concentrations 3–4 times the normal group 28. This data is supported by other researchers 29 who have observed elevated 8‐iso­PGF2α in breath condensate of asthmatics. Further evidence that allergen­induced asthma involves ROS and lipid peroxidation is the increase in urinary and bronchoalveolar lavage (BAL) fluid isoprostanes following an allergen challenge 30. The increased isoprostane concentration in BAL fluid 24 h after the challenge provides direct evidence that isoprostanes are produced in airway tissue and may contribute to the physical effects observed during the late response. Plasma 8‐iso­prostaglandin (PG)F2α concentrations in asthmatics (n=15) versus controls (n=15). Plot shows median (horizontal bar through box) and interquartile range 28. #: p=0.042. Other lipid peroxidation products have also been measured in asthma. Thiobarbituric acid­reactive substances (TBARS) measure the concentration of malondialdehyde (MDA), an end product of the oxidation and decomposition of polyunsaturated fatty acids containing three or more double bonds. Elevated MDA levels have been observed in both plasma 34–37 and breath condensate in asthmatics 38. Ethane is produced following lipid peroxidation of n‐3 fatty acids and elevated ethane levels have been reported in breath condensate of asthmatics 39. Exhaled pentane levels, produced following peroxidation of n‐6 fatty acids, were not different to controls 40. Antioxidant deficiencies have been frequently reported in asthmatics. The data is inconsistent, possibly due to variations in disease severity, diet, analytical techniques and body fluids being measured. However, overall, an antioxidant deficiency is indicated. Reports of nonenzymatic antioxidant deficiency include vitamin C (plasma/serum 35, 41, 42, whole blood 36 and BAL fluid 43), vitamin E (BAL fluid 43, bronchial wash 43, plasma/serum 35, 36 and erythrocytes 44) and β‐carotene (serum 35). Glutathione (GSH) is a key antioxidant in the lining fluid of the respiratory tract. Disturbed GSH status is reported in asthma, with total 45 and oxidised 43 GSH being elevated in BAL fluid and reduced GSH being elevated in erythrocytes 42. This suggests that GSH synthesis and/or transport has increased in response to the presence of excess oxidants and has subsequently been oxidised as it performs its antioxidant role. A compensatory but probably inadequate increase in GSH has been reported in other conditions of oxidative stress 64, 65. Reports on enzymatic antioxidant status in asthma are also inconsistent. SOD and glutathione peroxidase (GSHPx) form an important part of the antioxidant defence system. SOD catalyses the dismutation of O2·− into oxygen and hydroperoxide, which is then acted upon by GSHPx to form water. SOD activity has been reported to be increased 46, decreased 36, 47–51 or unchanged 28, 44, 45, 52, 53 in asthmatics compared with controls. Zn, a cofactor of SOD, has also been reported to be decreased 28, 54 or unchanged 55. Similarly, GSHPx activity has been reported to be decreased 36, 44, 53, 56–61 or unchanged 28, 47–49, 51, 52, 57, 60, 62 in asthmatics, with Se, a cofactor of GSHPx, being decreased 28, 57, 60–62 or unchanged 49, 57, 62. Catalase, another antioxidant enzyme, has also been reported to have low activity 36, 52 or unchanged 44, 47, 48, 51. While the data are difficult to compare due to differences in the disease severity, blood components and body fluids being measured, it is clear that overall, the status of the antioxidant enzymes and their cofactors is often altered in asthma, indicating a disturbed oxidant/antioxidant balance. There are a number of reports on oxidative stress in asthma, involving other markers such as direct measurement of ROS or protein oxidation, rather than lipid peroxidation. Some examples include elevated breath condensate levels of carbon monoxide 66, nitric oxide 12, 39, 44, 66, 67, nitrotyrosine 12 and H2O2 38, 66. These data provide further evidence of oxidative stress in asthma. The data previously published by the current authors also indicated that asthma severity is related to the extent of lipid peroxidation 28, with a positive association between 8‐iso­PGF2α concentrations and disease severity. A similar trend was recently reported by Montuschi et al. 29 who also reported that 8‐iso­PGF2α levels increased in breath condensate as asthma severity increased. A recent study by Paredi et al. 39 also provides evidence that lipid peroxidation is related to asthma severity. This study demonstrated that concentrations of exhaled ethane were increased in patients with more severe bronchoconstriction (forced expiratory volume in one second (FEV1) <60%), compared with less­constricted patients (FEV1>60%). These relationships between markers of oxidative stress (in particular 8‐iso­PGF2α) and disease severity suggest that such tests may indicate the clinical status of asthma patients. Further work is needed to determine reference ranges for oxidative stress biomarkers (including isoprostanes) in asthmatics of various disease severities and clinical status if they are to become a useful clinical tool. Elevated 8‐iso­PGF2α concentrations have been observed in a variety of respiratory diseases, including cystic fibrosis 68, 69, interstitial lung diseases 70, chronic obstructive pulmonary disease 71, 72 and asthma 28, 29. It is likely that the mechanisms leading to oxidative stress vary according to the disease, thus this review article focuses on asthma. The discovery of isoprostanes has generated much interest, as they provide a reliable index of oxidative stress in vivo. Isoprostanes are structurally stable, are produced in vivo and are present in relatively high concentrations 73. Thus, they overcome many of the methodological problems associated with other markers. Most methods previously available to assess oxidative stress in vivo suffer from a lack of specificity and/or sensitivity and are unreliable. Detectable levels of F2‐isoprostanes can be found in all normal animal and human biological fluids (including plasma, urine, bile, gastric juice, synovial fluid and cerebrospinal fluid), and esterified in normal animal tissues. Levels of F2‐isoprostanes detected exceed those of cyclooxygenase­derived prostanoids by one to two orders of magnitude 74. Indeed, as a marker of oxidative stress, 8‐iso­PGF2α determination of carbon tetrachloride (CCl4)­induced lipid peroxidation has been shown to be 20 times more sensitive than measurement of TBARS 73. In models of oxidant injury, levels of F2‐isoprostanes free in the circulation and esterified to tissue phospholipids are dramatically increased. For example, excretion of F2‐isoprostanes in the bile of normal rats after administration of CCl4 was observed to increase in a dose­dependent manner 75. Hepatotoxic doses of CCl4 have also caused hepatic lipid­esterified F2‐isoprostanes to increase up to 200­fold within 1 h 76. Awad et al. 76 also studied specific halothane­induced lipid peroxidation in rats. A four­fold increase in plasma F2‐isoprostanes and an 11­fold increase in liver F2‐isoprostanes was observed. Isoprostanes are stable when stored at −70°C for up to 6 months 77. The most common methods of quantifying isoprostanes are gas chromatography­mass spectrometry (GC­MS) and enzyme immunoassay (EIA). EIA is available in kit form and thus is a very quick, simple and cost­effective technique. The values of total 8‐iso­PGF2α observed in the authors' laboratory in normal plasma using the EIA method 28, 68 were similar to those obtained by Morrow et al. 78 using GC­MS. Batch­to­batch variability is minimised using standard curves with each assay plate. The major disadvantage of EIA kits is that the kits available at present only contain antibodies specific for the 8‐iso­PGF2α isomer. GC­MS has the advantage of being able to detect the multiple isomeric forms of isoprostanes. However, the equipment is costly and not widely available and the sample preparation protocols are time and labour intensive 33. Thus, the use of specific immunoassays have expanded research in this area, with several recent studies reportedly using the EIA methodology 28, 29, 70, 71, 79, 80. The reliability of isoprostanes as in vivo markers of lipid peroxidation makes them an extremely valuable tool for defining the potential of antioxidant agents 81. There are numerous opportunities for trials to examine the effects of antioxidants in preventing or ameliorating the pathology of diseases in which oxidative stress is implicated. Measurement of isoprostanes can provide information regarding which doses or combinations of antioxidants are maximally effective. Several studies have demonstrated that isoprostane levels can be suppressed using antioxidants. Administration of high doses of an antioxidant combination (including vitamin C, E and β‐carotene) in humans for 2 weeks reduced formation of isoprostanes by 25–55% 81. Similarly, a trial in which subjects received high doses of vitamin E for 2 weeks reduced isoprostane levels by 37% 81. Another trial including patients with hepatorenal syndrome revealed that infusion with SOD in three patients resulted in a 50% decrease in circulation levels of F2‐isoprostanes, only 30–60 min after initiating the infusion 73. Furthermore, F2‐isoprostane levels are increased in animals deficient in natural antioxidants, even without additional oxidant stress 73. The isoprostanes have emerged as an effective method of quantifying the potential of antioxidants to inhibit lipid peroxidation. Evidence has been presented to show that oxidised dietary fat does not interfere with isoprostane measurement. In a study by Gopaul et al. 82, a high­fat, fast­food meal did not contribute to the short­term postprandial concentrations of plasma 8‐iso­PGF2α. This is probably due to a dilution effect, as the quantity of 8‐iso­PGF2α obtained from a high­fat meal when diluted into the circulating blood volume is small compared with endogenous levels. This data is supported by others 74, 83, who have also shown that urinary concentrations of 8‐iso­PGF2α were unlikely to be compromised by diet. There has been some suggestion that 8‐iso­PGF2α may also be produced enzymatically by cyclooxygenase activity by some cells and tissues in vitro 84, which raises questions regarding the validity of isoprostanes as a marker of oxidative stress. Monocytes and platelets have shown the ability to synthesise 8‐iso­PGF2α via both cyclooxygenase and free radical­catalysed mechanisms in vitro 85. However, the quantities produced enzymatically appear to be trivial compared with the overall 8‐iso­PGF2α synthesis 86. Furthermore, enzymatic production does not appear to occur in humans in vivo 72. Although biomarkers such as concentrations of MDA, breath alkanes, hydroperoxides and others are satisfactory in many circumstances, they have met criticism by a number of investigators, particularly when examining oxidative stress in vivo 87, 88. These tests have limited specificity and/or sensitivity for oxidative stress or may be unreliable when applying the techniques to human subjects 87. MDA concentrations are often determined using the thiobarbituric acid (TBA) assay. MDA is an end product of the oxidation and decomposition of polyunsaturated fatty acids containing three or more double bonds. MDA is derived from TBA to form the MDA­TBA adduct. This adduct is most commonly quantified using a spectrophotometric assay 88. There have been concerns about the specificity and validity of the TBARS assay 87, 88. The reasons for concern include possible interference with haemoglobin or biliverdin present in the sample, the heating condition during the assay, the presence of iron in the reagents used for analysis, rapid metabolism of MDA and the fact that MDA represents <1% of lipid peroxides 88. Thus, it is not recommended to be used as a sole index of lipid peroxidation 89. Some investigators are now measuring MDA directly, by using high­performance liquid chromatography (HPLC) to separate MDA from other interfering chromagens, thus improving specificity 90. However, this approach does not overcome all the limitations of the MDA method. Primary peroxidation products of lipids can be detected in plasma using HPLC or GC­MS. The instability of lipid hydroperoxides can make measurements difficult, as they are readily broken down into alkenes and aldehydes 88. This noninvasive technique involves measuring pentane exhalation as the end product of (n‐6) fatty acid peroxidation and ethane exhalation as the end product of (n‐3) fatty acid peroxidation 88. The test may be misleading, as hydrocarbon gas production depends on the presence of metal ions to decompose lipid peroxides. If such ions are only available in limited amounts, this index may be inaccurate 91. Other problems include contamination of the atmosphere by these gases, the metabolism of pentane in the liver by cytochrome P450 88, 91 and the concentration of oxygen in vivo, which affects gas production 91. The resistance of low density lipoproteins (LDL) to induced oxidative stress has been established as a model for studying the protection of polyunsaturated fatty acids by antioxidants in vivo 92. When isolated LDL is exposed to Cu2+ as a pro­oxidant under standardised conditions, the lag time preceding the onset of lipid peroxidation formation indicates resistance of LDL to oxidative stress. This test is also subject to criticism as it cannot be known for certain whether the in vitro situation accurately reflects in vivo events. Measurement of auto­antibodies directed against oxidative modifications of LDL is a recently developed technique that provides an in vivo marker of lipid peroxidation 93. Enzyme­linked immunosorbent assays are available in kit form, providing a quick and simple methodology. However, further understanding of the mechanisms leading to oxidative modification of LDL is necessary, as it has been suggested that such modifications may occur independently of lipid peroxidation 94. Various biological tissues and fluids contain a range of antioxidants to protect against oxidative damage. For example, human blood contains small molecular antioxidants such as vitamin E, C and β‐carotene, as well as enzymatic antioxidants such as SOD, GSHPx and catalase. Important antioxidants in the respiratory tract lining fluid include reduced GSH, mucin, uric acid, vitamin C and albumin 95. Antioxidants are consumed in times of oxidative stress, thus measurement of these is an indirect marker of the degree of oxidative stress in a system. However, such data must be interpreted with caution, as antioxidant deficiencies may be due to factors other than increased utilisation. The total radical trapping antioxidant potential (TRAP) and Trolox equivalent antioxidant capacity (TEAC) are assays designed to describe total capacity to withstand free­radical stress 96. The TRAP assay measures the ability of plasma to buffer a sample of linoleic acid against peroxidation using a heat­labile initiator as the free radical source. The peroxidation level is followed as a decrease in oxygen content of the sample 97. The TEAC assay compares the antioxidant capacity of plasma with that of the potent antioxidant Trolox 34. These assays give some indication of the strength of the antioxidant screen, however, these assays are only an indirect marker of the degree of oxidative stress. As with other measurements of antioxidant concentration, low TRAP or TEAC values may be due to factors other than increased utilisation of antioxidants in the presence of excess ROS. While many of the studies of oxidative stress in asthma have used blood biomarkers (table 2⇑), it is uncertain whether they accurately represent conditions at the airway surface, the site of oxidative damage. A recent report by Kelly et al. 43 attempted to gain a more accurate picture of local antioxidant defences in the lungs by sampling lung­lining fluid. Using BAL fluid, deficiencies in vitamins C and E and an increase in oxidised GSH levels were observed. Interestingly, these deficiencies were not reflected in plasma. Plasma vitamin C concentrations were similar to controls, while plasma vitamin E concentrations were elevated in asthmatics. This emphasises the importance of not relying on blood biomarkers alone to indicate airway antioxidant status and highlights the fact that the relationship between plasma and lung­lining fluid antioxidant pools is unknown. It is likely that an accurate estimate of the status of antioxidant defences requires sampling directly from the site of oxidant damage, which in asthma is the airway. Induced sputum samples have been determined to contain a range of biomarkers useful for studying the lower respiratory tract 98 and provide a noninvasive alternative to BAL samples. Induced sputum is collected by coughing following saline inhalation. Thus, the noninvasive nature of the sample collection is advantageous compared with collection of BAL fluid, which must be performed under anaesthetic. Isoprostanes can be measured in induced sputum by EIA and levels are at least an order of magnitude higher than plasma levels 80. Several recent studies of oxidative stress in asthma have used breath condensate samples 12, 29, 38, 39, 99. Collection of these samples is also noninvasive, however, the method is limited. Technical modifications may have overcome some of the practical problems, including elimination of ambient contamination of exhaled breath 39, but breath condensate samples are not suitable for a comprehensive analysis of oxidative stress and antioxidant defences as they rely on the volatility of the substances being measured. Thus, induced sputum samples may be the most suitable method of directly examining the spectrum of markers of oxidative stress in a variety of conditions. Despite the abundance of evidence indicating elevated oxidative stress and reduced antioxidant defences in asthma, antioxidant supplementation studies to date have been limited. The only longer term (>1 week) supplementation trials have been encouraging, involving vitamin C 100 and Se 101, both of which led to a positive improvement in asthma symptoms. However, since much of the epidemiological data suggests that whole foods (in particular fruit and vegetables) are related to asthma symptoms, it is likely that the most effective form of dietary supplementation will involve a combination of antioxidants, possibly including less well­known antioxidants (such as other flavonoids and carotenoids) that have not been considered previously in relation to asthma. This reinforces the need for a systematic and comprehensive evaluation of the antioxidant status of the asthmatic airways, to establish what combination of antioxidants will be most effective in correcting any deficiencies, thereby potentially reducing asthma incidence and severity. Evaluating the multiple and complex therapeutic combinations will be facilitated by sensitive biomarkers of oxidative stress, measured directly in the airway. Isoprostane measurement in exhaled breath condensate or induced sputum appears ideally suited to this application. Oxidative stress and disturbed antioxidant status in asthmatics are well established. However, no systematic examination of lipid peroxidation and antioxidant defences in asthmatic airways exists. A comprehensive biochemical evaluation of antioxidant defences is needed to identify the nature and extent of any deficiencies. Much of the reported data has been obtained from various blood components, which may not be representative of what is happening at the airway surface, the initial site of oxidation. Thus, examination of airway biomarkers is critical to determine the potential for antioxidant supplementation to restore the oxidant/antioxidant imbalance. Measurement of isoprostanes in breath condensate or induced sputum should provide useful information concerning the degree of oxidant stress and success of antioxidant therapy in asthma. Barnes PJ. Reactive oxygen species and airway inflammation. Free Rad Biol Med 1990;9:235–243. Downs SH, Marks GB, Sporik R, Belosouva EG, Car NG, Peat JK. Continued increase in the prevalence of asthma and atopy. Arch Dis Child 2001;84:20–23. Fogarty A, Britton J. The role of diet in the aetiology of asthma. Clin Exp Allergy 2000;30:615–627. Doelman CJA, Bast A. Oxygen radicals in lung pathology. Free Rad Biol Med 1990;9:381–400. Levine SJ. Bronchial epithelial cell­cytokine interactions in airway inflammation. J Invest Med 1995;43:241–249. Neyens HJ, Raatgeep RE, Degenhart HJ, Duiverman EJ, Kerrebijn KF. Altered leukocyte response in relation to the basic abnormality in children with asthma and bronchial hyperresponsiveness. Am Rev Respir Dis 1984;130:744–747. Cluzel M, Damon M, Chanez P, et al. Enhanced alveolar cell luminol­dependent chemiluminescence in asthma. J Allergy Clin Immunol 1987;80:195–201. Jarjour NN, Calhoun WJ. Enhanced production of oxygen radicals in asthma. J Lab Clin Med 1994;123:131–136. Kharitonov SA, Yates D, Robbins RA, Logan­Sinclair R, Shinebourne EA, Barnes PJ. Increased nitric oxide in exhaled air of asthmatic patients. Lancet 1994;343:133–135. Radi R, Beckman J, Bush K, Freeman B. Peroxynitrite­induced membrane lipid peroxidation: The cytotoxic potential of superoxide and nitric oxide. Arch Biochem Biophys 1991;288:481–487. Wu W, Chen Y, Hazen SL. Eosinophil peroxidase nitrates protein tyrosyl residues. Implications for oxidative damage by nitrating intermediates in eosinophilic inflammatory disorders. J Biol Chem 1999;274:25933–25944. Hanazawa T, Kharitonov SA, Barnes PJ. 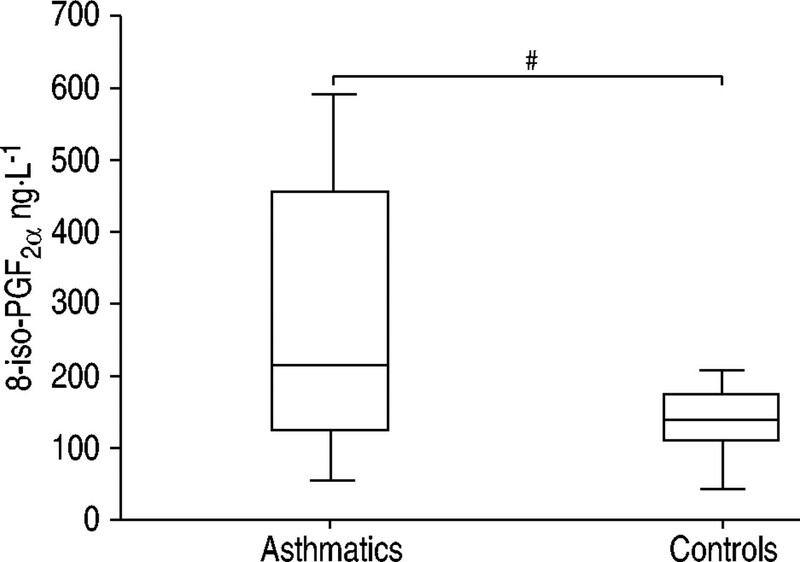 Increased nitrotyrosine in exhaled breath condensate of patients with asthma. Am J Respir Crit Care Med 2000;162:1273–1276. Rhoden KJ, Barnes PJ. Effect of hydrogen peroxide on guinea­pig tracheal muscle in vitro: role of cyclo­oxygenase and airway epithelium. Br J Pharmacol 1989;98:325–330. Katsumata U, Miura M, Ichinose M, et al. Oxygen radicals produce airway constriction and hyperresponsiveness in anesthetized cats. Am Rev Respir Dis 1990;141:1158–1161. Weiss EB, Bellino JR. Leukotriene­associated toxic oxygen metabolites induces airway hyperreactivity. Chest 1986;89:709–716. Adler KB, Holden­Stauffer WJ, Repine JE. Oxygen metabolites stimulate release of high­molecular weight glycoconjugates by cell and organ cultures of rodent respiratory epithelium via arachidonic acid dependent mechanism. J Clin Invest. 1990;85:75–85. Phipps RJ, Denas SM, Sielczak MV, Wanner A. The effect of 0.5ppm ozone on glycoprotein secretion, ion and water fluxes in sheep trachea. J Appl Physiol 1986;60:918–927. Doelman CJA, Leurs R, Oosterom WC, Bast A. Mineral dust exposure and free radical­mediated lung damage. Exp Lung Res 1990;16:41–55. del Maestro RF, Bjork J, Arfors K. Increase in microvascular permeability induced by enzymatically generated free radicals. I. In vivo study. Microvasc Res 1981;22:239–254. Tate RM, van Benthuysen KM, Shasby DM, McMurtry IF, Repine JE. Oxygen­radical­mediated permability edema and vasoconstriction in isolated perfused rabbit lungs. Am Rev Respir Dis 1982;126:802–806. Biagioli MC, Kaul P, Singh I, Turner RB. The role of oxidative stress in rhinovirus induced elaboration of IL‐8 by respiratory epithelial cells. Free Rad Biol Med 1999;26:454–462. Kawikova I, Barnes PJ, Takahashi T, Tadjkarimi S, Yacoub MH, Belvisi MG. 8‐epi­PGF2alpha, a novel noncyclooxygenase­derived prostaglandin, constricts airways in vitro. Am J Respir Crit Care Med 1996;153:590–596. Fukunaga M, Takahashi K, Badr KF. Vascular smooth muscle actions and receptor interactions of 8‐iso­prostaglandin E2, an E2­isoprostane. Biochem Biophys Res Comm 1993;195:507–515. Held HD, Uhlig S. Mechanisms of endotoxin­induced airway and pulmonary vascular hypperreactivity in mice. Am J Respir Crit Care Med 2000;162:1547–1552. Okazawa A, Kawikova I, Cui Z, Skoogh B, Lotvall J. 8‐epi­PGF2alpha induces airflow obstruction and airway plasma exudation in vivo. Am J Respir Crit Care Med 1997;155:436–441. Kromer BM, Tippins JR. Coronary artery constriction by the isoprostane 8‐epi­prostaglandin F2alpha. Br J Pharmacol 1996;119:1276–1280. Mobert J, Becker BF, Zahler S, Gerlach E. Hemodynamic effects of isoprostanes (8‐iso­prostaglandin F2alpha and E2) in isolated guinea pig hearts. J Cardiovasc Pharmacol 1997;29:789–794. Wood LG, Fitzgerald DA, Gibson PG, Cooper DM, Garg ML. Lipid peroxidation as determined by plasma isoprostanes is related to disease severity in mild asthma. Lipids 2000;35:967–974. Montuschi P, Corradi M, Ciabattoni G, Nightingale J, Kharitonov SA, Barnes PJ. Increased 8‐isoprostane, a marker of oxidative stress, in exhaled condensation in asthma patients. Am J Respir Crit Care Med 1999;160:216–220. Dworski R, Murray JJ, Roberts LJI, et al. Allergen­induced synthesis of F2­isoprostanes in atopic asthmatics. Am J Respir Crit Care Med 1999;160:1947–1951. Takahashi K, Nammour TM, Fukunaga M, Ebert JD, Morrow JD, Roberts LJ. Glomerular actions of a free radical generated novel prostaglandin, 8‐epi­PGF2α, in the rat. Evidence for interactions with thromboxane A2 receptors. J Clin Invest 1992;90:136–141. Fukunaga M, Yura T, Grygorczyk R, Badr KF. Evidence for the distinct nature of F2­isoprostane receptors from those of thromboxane A2. Am J Physiol 1997;272:F477–F483. Quaggiotto P, Garg ML.. Isoprostanes: indicators of oxidative stress in vivo and their biological activityIn: Basu TK, Norman T, Garg ML, editors. Antioxidants in Human Health and DiseasesOxford, CAB International, 1999; pp. 393–410. Rahman I, Morrison D, Donaldson K, MacNee W. Systemic oxidative stress in asthma, COPD and smokers. Am J Respir Crit Care Med 1996;154:1055–1060. Kalayci O, Besler T, Kilinc K, Sekerel BE, Saraclar Y. Serum levels of antioxidant vitamins (alpha tocopherol, beta carotene, and ascorbic acid) in children with bronchial asthma. Turkish J Pediatr 2000;42:17–21. Shanmugasundaram KR, Kumar SS, Rajajee S. Excessive free radical generation in the blood of children suffering from asthma. Clinica Chimica Acta 2001;305:107–114. Ozarus R, Tahan V, Turkmen S, et al. Changes in malondialdehyde levels in bronchoalveolar fluid and serum by the treatment of asthma with inhaled steroid and beta2­agonist. Respirology 2000;5:289–292. Antczak A, Nowak D, Shariati B, Krol M, Piasecka G, Kurmanowska Z. Increased hydrogen peroxide and thiobarbituric acid­reactive products in expired breath condensate of asthmatic patients. Eur Respir J 1997;10:1235–1241. Paredi P, Kharitonov SA, Barnes PJ. Elevation of exhaled ethane concentration in asthma. Am J Respir Crit Care Med 2000;162:1450–1454. Olopade CO, Zakkar M, Swedler WI, Rubinstein I. Exhaled pentane levels in acute asthma. Chest 1997;111:862–865. Aderele WI, Ette SI, Oduwole O, Ikpeme SJ. Plasma vitamin C (ascorbic acid) levels in asthmatic children. Afr J Med Sci 1985;14:115–120. Vural H, Uzun K. Serum and red blood cell antioxidant status in patients with bronchial asthma. Can Respir J 2000;7:476–480. Kelly FJ, Mudway I, Blomberg A, Frew A, Sandstrom T. Altered lung antioxidant status in patients with mild asthma. Lancet 1999;354:482–483. Mohan IK, Das UN. Oxidant stress, antioxidants, nitric oxide and essential fatty acids in bronchial asthma. Med Sci Res 1997;25:307–309. Smith LJ, Houston M, Anderson J. Increased levels of glutathione in bronchoalveolar lavage fluid from patients with asthma. Am Rev Respir Dis 1993;147:1461–1464. Kurosawa M, Kobayashi H, Nakano M. Cu­Zn superoxide dismutase activities in platelets from stable bronchial asthmatic patients. Int Arch Allergy Immunol 1993;101:61–65. DeRaeve HR, Thunnissen FBMJ, Kaneko FT, et al. Decreased Cu,Zn­SOD activity in asthmatic airway epithelium: Correction by inhaled corticosteroid in vivo. Am J Physiol 1997;272:L148–L154. Smith LJ, Shamsuddin M, Sporn PHS, Denenberg M, Anderson J. Reduced superoxide dismutase in lung cells of patients with asthma. Free Rad Biol Med 1997;22:1301–1307. Fenech AG, Ellul­Micallef R. Selenium, glutathione peroxidase and superoxide dismutase in Maltese asthmatic patients: effect of glucocorticoid administration. Pulm Pharmacol Ther 1998;11:301–308. Comhair SAA, Bhathena PR, Dweik RA, Kavuru M, Erzurum SC. Rapid loss of superoxide dismutase activity during antigen­induced asthmatic response. Lancet 2000;355:624. Tekin D, Ayse Sin B, Mungan D, Misirligil Z, Yavuzer S. The antioxidant defense in asthma. J Asthma 2000;37:59–63. Novak Z, Nemeth I, Gyurkovits K, Varga SI, Matkovics B. Examination of the role of oxygen free radicals in bronchial asthma in childhood. Clinica Chimica Acta 1991;201:247–252. Powell CVE, Nash AA, Powers HJ, Primhak RA. Antioxidant status in asthma. Pediatr Pulmonol 1994;18:34–38. Vural H, Uzun K, Uz E, Kocyigit A, Cigli A, Akyol O. Concentrations of copper, zinc and various elements in serum of patients with bronchial asthma. J Trace Elements Med Biol 2000;14:88–91. Goldey DH, Mansmann HC, Rasmussen AI. Zinc status of asthmatic, prednisone­treated asthmatic, and non­asthmatic children. J Am Dietetic Assoc 1984;84:157–163. Bibi H, Schlesinger M, Tabachnik E, Schwartz Y, Iscovitz H, Iaina A. Erythrocyte glutathione peroxidase activity in asthmatic children. Ann Allergy 1988;61:339–340. Flatt A, Pearce N, Thomson CD, Sears M, Robinson MF, Beasley R. Reduced selenium in asthmatic subjects in New Zealand. Thorax 1990;45:95–99. Hasselmark L, Malmgren R, Unge G, Zetterstrom O. Lowered platelet glutathione peroxidase activity in patients with intrinsic asthma. Allergy 1990;45:523–527. Pearson DJ, Suarez­Mendez VJ, Day JP, Miller PF. Selenium status in relation to reduced glutathione peroxidase activity in aspirin­sensitive asthma. Clin Exp Allergy 1991;21:203–208. Misso NLA, Powers KA, Gillon RL, Stewart GA, Thompson PJ. Reduced platelet glutathione peroxidase activity and serum selenium concentration in atopic asthmatic patients. Clin Exp Allergy 1996;26:838–847. Kadrabova J, Madaric A, Kovakicova Z, Podivinsky F, Ginter E, Gazdik F. Selenium status is decreased in patients with intrinsic asthma. Biol Trace Element Res 1996;52:241–248. Stone J, Hinks LJ, Beasley R, Holgate ST, Clayton BA. Reduced selenium status of patients with asthma. Clin Sci 1989;77:495–500. Dauletbaev N, Rickmann J, Viel K, Buhl R, Wagner T‐O‐F, Bargon J. Glutathione in induced sputum of healthy individuals and patients with asthma. Thorax 2001;56:13–18. Toth KM, Berger EM, Beehler CJ, Repine JE. Erythrocytes from cigarette smokers contain more glutathione and catalase and protect endothelial cells from hydrogen peroxide than do erythrocytes from nonsmokers. Am Rev Respir Dis 1986;134:281–284. Borm PJ, Bast A, Wouters EF, Slangen JJ, Swaen GM, Border DE. Red blood cell antioxidant parameters in healthy elderly control subjects versus silicosis patients. Free Rad Res Comm 1987;3:117–127. Horvath I, Donnelly LE, Kiss A, Paredi P, Kharitonov SA, Barnes PJ. Raised levels of exhaled carbon monoxide are associated with an increased expression of heme oxygenase‐1 in airway macrophages in asthma: a new marker of oxidative stress. Thorax 1998;53:668–672. Wood LG, Fitzgerald DA, Gibson PG, Cooper DM, Collins CE, Garg ML. Oxidative stress in cystic fibrosis: dietary and metabolic factors. J Am Coll Nutr 2001;20:Suppl. 2, 157–165. Montuschi P, Paredi P, Corradi M. 8‐isoprostane, a biomarker of oxidative stress is increased in cystic fibrosis. Am J Respir Crit Care Med 1999;159:A271. Montuschi P, Ciabattoni G, Paredi P, et al. 8‐isoprostane as a biomarker of oxidative stress in interstitial lung diseases. Am J Respir Crit Care Med 1998;158:1524–1527. Montuschi P, Collins JV, Ciabattoni G, et al. Exhaled 8‐isoprostane as an in vivo biomarker of lung oxidative stress in patients with COPD and healthy smokers. Am J Respir Crit Care Med 2000;162:1175–1177. Pratico D, Basili S, Vieri M, Cordova C, Violi F, Fitzgerald GA. Chronic obstructive pulmonary disease is associated with an increase in urinary levels of isoprostane F2a III, an index of oxidant stress. Am J Respir Crit Care Med 1998;158:1709–1714. Awad JA, Roberts LJ 2nd, Burk RF, Morrow JD. Isoprostanes­prostaglandin­like compounds formed in vivo independently of cyclooxygenase: use as clinical indicators of oxidant damage. Gastroenterol Clin N Am 1996;25:409–427. Morrow JD, Hill KE, Burk RF, Nammour TM, Badr KF, Roberts LJ. A series of prostaglandin F2­like compounds are produced in vivo in humans by a non­cyclooxygenase, free radical­catalysed mechanism. Proc Natl Acad Sci USA 1990;87:9383–9387. Awad JA, Morrow JD. Excretion of F2­isoprostanes in bile: A novel index of hepatic lipid peroxidation. Hepatology 1995;22:962–968. Awad JA, Horn J‐L, Roberts LJ, Franks JJ. Demonstration of halothane­induced hepatic lipid peroxidation in rats by quantification of F2­isoprotanes. Anesthesiology 1996;84:910–916. Morrow JD, Roberts LJ 2nd. The isoprostanes. Current knowledge and directions for future research. Biochem Pharmacol 1996;51:1–9. Morrow JD, Frei B, Longmire AW, et al. Increase in circulating products of lipid peroxidation (F2­isoprostanes) in smokers. N Engl J Med 1995;332:1198–1203. Collins CE, Quaggiotto P, Wood L, O'Loughlin EV, Henry RL, Garg ML. Elevated plasma levels of F2alpha isoprostane in cystic fibrosis. Lipids 1999;34:551–556. Wood LG, Fitzgerald DA, Gibson PG, Cooper DM, Garg ML. Increased plasma fatty acid concentration following respiratory exacerbations in cystic fibrosis is associated with elevated oxidative stress. Am J Clin Nutr 2002;75:668–675. Roberts LJ 2nd, Morrow JD. The generation and actions of isoprostanes. Biochim Biophys Acta 1997;1345:121–135. Gopaul NK, Zacharowski K, Halliwell B, Anggard EE. Evaluation of the postprandial effects of a fast­food meal on human plasma F2­isoprostane levels. Free Rad Biol Med 2000;28:806–814. Richelle M, Turini ME, Guidoux R, Tavazzi I, Mefairon S, Fay LB. Urinary isoprostane excretion is not confounded by the lipid content of the diet. FEBS Letters 1999;459:259–262. Klein T, Reutter F, Schweer H, Nusing RM. Generation of the isoprostane 8‐epi­prostaglandin F2 alpha in vitro and in vivo via the cyclooxygenases. J Pharmacol Exp Ther 1997;282:1658–1665. Pratico D, Fitzgerald GA. Generation of 8‐epiprostaglandin F2alpha by human monocytes. Discriminate production by reactive oxygen species and prostaglandin endoperoxide synthase‐2. J Biol Chem 1996;271:8919–8924. Pratico D, Lawson JA, Fitzgerald GA. Cyclooxygenase dependent formation of the isoprostane, 8‐epi prostaglandin F2alpha. J Biol Chem 1995;270:9800–9808. Halliwell B, Grootveld M. The measurement of free radical reactions in humans. FEBS Letters 1987;213:9–14. Pincemail J, Defraigne JO, Limet R. Oxidative stress in clinical situations ­ fact or fiction?. Eur J Anaesthesiol 1996;13:219–234. Brown RK, Kelly FJ. Evidence for increased oxidative damage in patients with cystic fibrosis. Pediatr Res 1994;36:487–493. Tatum VL, Changchit C, Chow CK. Measurement of malondialdehyde by high performance liquid chromatography with fluorescence detection. Lipids 1990;25:226–229. Gutteridge JMC, Halliwell B. The measurement and mechanism of lipid peroxidation in biological systems. TIBS 1990;15:129–135. Esterbauer H, Striegl G, Puhl H, Rotheneder M. Continuous monitoring of in vitro oxidation of human low density lipoprotein. Free Rad Res Comm 1989;6:67–75. Tatzber F, Wonisch W, Schmidl E, Esterbauer H. Quantitative determination oLAb titers in various animal species. Biofactors 1997;6:125–130. Holvoet P. Oxidative modification of low­density lipoproteins in atherothrombosis. Acta Cardiologica 1998;53:253–260. Cross CE, van der Vliet A, O'Neill C, Louie S, Halliwell B. Oxidants, antioxidants, and respiratory tract lining fluids. Environ Health Perspect 1994;102:Suppl. 10, 185–191. Wayner DDM, Burton GW, Ingold KU, Locke S. Quantitative measurement of the total peroxyl radical­trapping antioxidant capability of human blood plasma by controlled peroxidation. FEBS Letters 1985;187:33–37. Langley SC, Brown RK, Kelly FJ. Reduced free­radical­trapping capacity and altered plasma antioxidant status in cystic fibrosis. Pediatr Res 1993;33:247–250. Gibson PG, Henry RL, Thomas P. Noninvasive assessment of airway inflammation in children: induced sputum, exhaled nitric oxide, and breath condensate. Eur Respir J 2000;16:1008–1015. Horvarth I, Donnelly LE, Kiss A, et al. Combined use of exhaled hydrogen peroxide and nitric oxide in monitoring asthma. Am J Respir Crit Care Med 1998;158:1042–1046. Anah CO. High dose ascorbic acid in Nigerian asthmatics. Trop Geogr Med 1980;32:132–137. Hasselmark L, Malmgren R, Zetterstrom O, Unge G. Selenium supplementation in intrinsic asthma. Allergy 1993;48:30–36.